Los autores de este libro, con isbn 978-84-8323-709-0, son Sue Elliott y Emma Heyderman, esta publicación tiene noventa y seis páginas. 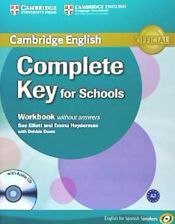 Otros libros de Heyderman, Emma son Complete Key For Schools For Spanish Speakers Teacher's Book, Complete Pet For Spanish Speakers Without Answers, Complete Pet For Spanish Speakers Student's Book With Answers With Cd-rom, Complete Pet For Spanish Speakers Class Audio Cds (4), Complete Pet For Spanish Speakers Teacher's Book y Complete Key For Schools For Spanish Speakers Student's Pack (student's Book Without Answers With Cd-rom, Workbook Without Answers With Audio Cd). Decouvrez les aventures captivantes d'Albert et Folio . Structure:. Cambridge Vocabulary for PET is informed by the Cambridge International Corpus and the Cambridge..
Mr James Conway wants to make money. He wants to build new houses and shops - and he wants to build them on an old graveyard, on the island of Haiti. There is only one old man who still visits the graveyard; and Mr Conway is not afraid of one old man.